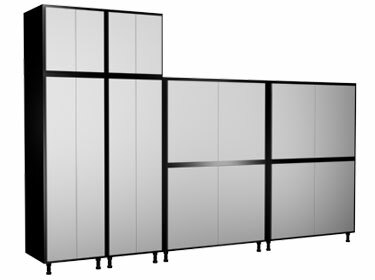 A 12x8 foot Tech Series Garage Storage Wall - A WHOLE WALL of STORAGE Cabinets! We don't just call this the storage wall for nothing... At 12 feet long and 8 feet tall this garage storage system really provides a ridiculous amount of storage space. You can place this system along any wall in your garage and it will not interfere with the garage door rail! And if you somehow find that you need even more storage space you've come to the right place, all Slide-Lok cabinets and systems mix and match so you can always add on to create your own custom one of a kind garage storage system.